Humboldt State University's Fred Telonicher Marine Laboratory houses a touch pool for all ages to learn about creatures living in the intertidal zone of northcoast waters. 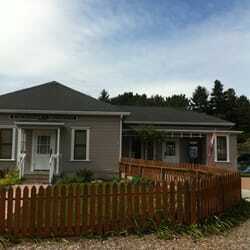 The Humboldt State University Marine Lab was established in 1965 to provide a center for marine and environmental science teaching and research for the students and faculty of the College of Natural Resources and Sciences. Located on a bluff that overlooks the Pacific Ocean in Trinidad, the HSU Marine Lab provides ready access to the local marine environments of rocky shorelines, sandy beach and offshore kelp beds. This dramatic coastline of California remains one of the most pristine natural areas of the state. The lab is well equipped to support both teaching and research projects on the marine life and the ocean environments. Located off Main Street and Patrick's Point Drive at the entry way to the charming coastal village of Trinidad, is a newly rehabilitated circa 1899-1900 Victorian Italianate bungalow. There are Native American exhibits featuring the redwood canoe carved from one log by Axel Lindgren, exquisite Indian baskets, implements, regalia and a magnificent mural painted by Susan Morton of the old Tsurai Village site above Old Home Beach. Other rooms feature natural history, historic photographs from the Katie Boyle and Gwyneth Susan collections and a Heritage Room recreating an early twentieth century kitchen. 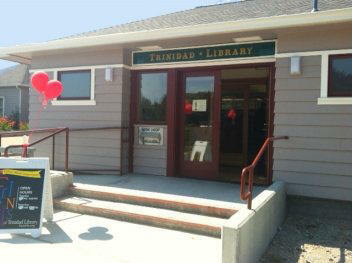 Trinidad Library- Brand New Recently opened. Next door to the Museum. The Humboldt County Library provides resources and opportunities to support lifelong learning, local heritage, and the cultural, recreational, and information needs of our communities. Toddler Story Time Every Thursday at 10:00 a.m. Stories, songs, and sometimes puppets! All preschoolers and their families are welcome. Summer Reading at Trinidad Library the adventure continues through the summer. Bring in your reading log any time before school starts and receive a book prize! Pajama Story Time Stop by at 6:00 p.m. on the last Thursday of each month for this relaxing evening story time. Children are encouraged to wear pajamas and bring a stuffed animal. The Book Buddies meet on the second Thursday of each month, at 11:00 a.m. Need some recommendations for new books to read? Want to share a great new read with someone? This casual community gathering discusses books, shares recent reads, and offers new suggestions of titles to read. No mandatory reading is required, just a love of reading. Stop by! Mark your calendar and make the first Saturday of October through May your regular date for a fun adventure in the redwoods. The Newton B. Drury Scenic parkway will close Friday night at 5 p.m. and re-open Sunday morning. These Saturday closures occur from October through May on the first weekend of each month. During the closures, access to the Elk Prairie Campground and Visitor Center will remain open. Closing the 10-mile through route to motorized vehicles provides an opportunity for park visitors to safely experience the parkway without the noise and sounds of cars and trucks. Come explore by foot, bicycle, skateboard, rollerblades or any other non-motorized vehicle. Dogs-on-leash are also welcome on the parkway, although prohibited on park trails for the safety of pets and wildlife. 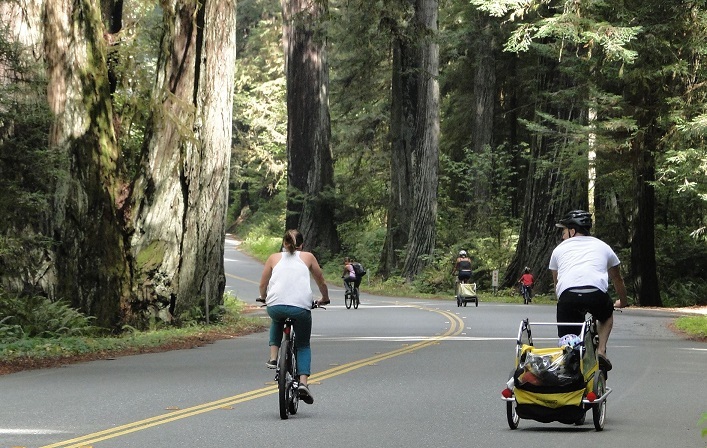 The parkway has something for everyone, from families with young children looking for a safe and easy ride, to those looking for a more physically-challenging route. Much of the southern end of the parkway is relatively flat, while the hills of the northern portion require more energy. However, all efforts are rewarded by a long, smooth downhill glide all the way back to the prairie. In addition, although the parkway is closed, many of the trails for both short and long hikes begin within a short walk from the parking areas. Trinidad Union School District opens its playground to the general public after school hours. There is a preschool play area as well as an apparatus that is appropriate for age groups K-8. A running track, play field, and baseball area are located adjacent to the playground with an ocean view in the distance!